We are a group of historical games in Gothenburg that have grown a bit tiered of Flames of War and want to try an interesting what if scenario during the cold war. We also wanted to try a different scale and zoom out more to get the divisional level of gaming. 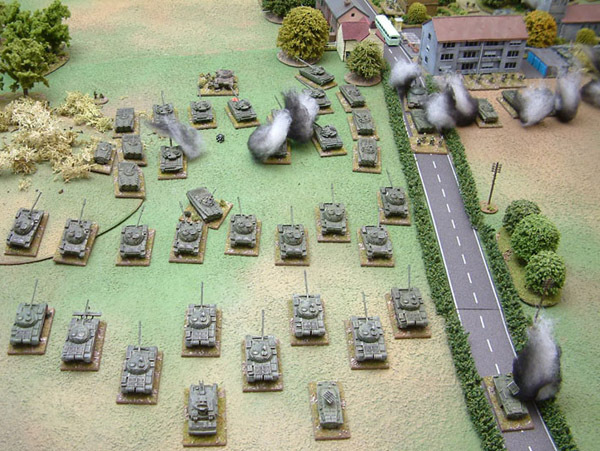 Some one in the group heard about Cold war Commander rules that are a streamlined historical rules set that is built for combined arms that is suitable for 6-10mm models. 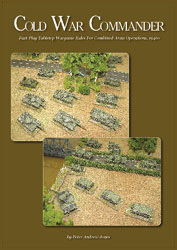 So I picked up the PDF rules from Specialist Military Publishing and read the trough. First you realise that this is a much smaller production compared to Battle fronts games. This is not a bad thing in my opinion the rules from minor publicist tends to be more worked through and have less errors. The book is about 140 pages where more than half is different army list for different conflicts after 1946 to modern times. Of the remaining 70 pages are 40 pages rules including long examples with full colour pictures that explain the different rules and game play. First segment is the scheduled phase, here is where pre-scheduled support will be used. This is air-support or off-board artillery. These support is possible in various scenarios and you have to buy them in the rooster. Before you start your first turn will you designate which turn and towards what target your support will come. This is a very neat way to handle preliminary bombardments and air strikes before or during an assault. I like the idea that the commander plan his operation before it´s started and have pointed out specific targets. Second segment in the turn is the initiative phase. This phase can soldiers and tanks react on the enemy with out any order from the commander. Depending on the doctrine the country has for it´s army is this reaction distance different. Guerrillas are more flexible and can react if the enemy come with in 30cm compared to Soviet more rigid command structure with little initiative from the commander can they only react if the enemy is with in 10cm. During this initiative phase can you shoot and assault if possible. Third segment and the main segment is the command phase. Here is where you will issue orders (move, shoot and assault) with you HQ and CO to the various formations and units on the battle field. Here is where this game really shines in my opinion. To issue a order do you need to pass a order test. To pass the test do you need to roll two D6 dices and get lower than you HQ or CO command value. Normal stats for Nato HQ 9 and CO 10 compared to Soviet HQ 8 and CO 9. You can continue give orders with your commander but your command value will be lower -1 every time you give an order to the same formation/unit. So it will get harder and hard to give orders to the same unit. When you HQ miss a command role will he be spent and you continue with your next HQ. Also the distance to your unit/formation is relevant so you will not spread out your troops to much because then will it be harder to give orders to your units. You are allowed to give orders twice or more to your units but only with the same HQ or CO. So there is a limit of how may times a unit can act but it depends on luck and commander value. Also during the command phase can you call in air support and artillery support with designated teams FAO/FAC. It is the same procedure here. You have to pass a command test for the FAO/FAC to get support and then designate a visible target for your support. And the last thing that happens is that your command units move. Fourth segment is the end phase where you check for victory conditions and remove hit markers. These are the essential steps of the game. It is rather basic for being combined arms and I think the game will have a nice flow. The orders/actions is; Moving simple as it sounds move up to the move distance for the unit. There is terrain restrictions which is similar to order games. Shooting order is resolved with formation/unit designate target/targets for each unit and role the amount of dice according to the there stats. You will hit your target on 4+ if it´s in the open and 5 - 6+ if the target is in cover of some sort. You count the hits and if the target have a save value will it role saves for each hit. Mark the unsaved hits if it´s below the units hit points. Then role all the unsaved hits again and if they are equal or more than the score needed to be hit will the unit be suppressed and if its suppressed will it retreat x-cm where the x is the amount of successful suppress roles. This sound harder than it is. I think the idea that the designer is after is that you will suppress units and push them of important ground. And it is not easy to kill a tank unit if you don´t concentrate your fire. There is allot more to the rules than describe above. The artillery support and how it interacts with the game and the Air units and Helicopters. There is also rules how to handle helicopter airborne attacks and beach assaults. And off course are there rules how to handle field defences and removal of them. So my verdict: I like the rules and the book. It is very compact and not much text that will mislead you and interpret the rules wrong. There is some questions marks from my first read but I think it will be sorted out when we play a few times. I like the command system and I think it will make the turn exciting when you try to do the last thing in the turn to win but you fail your command role and your units are standing in the open and are eaten up the next turn. So there will be some intense roles the good thing is that the command roles are done with 2D6 which makes it more predictable. The only real issue is the poor quality of the pictures and examples of play. There could also be some more pictures or guide for the different armies in the back. I had to make allot of research on the net to figure out how the BAOR (British army of the Rhine) was build during the cold war. But you can not expect every thing from a book that cost me 12£ + 8€ for printing and spiral bounding. I am looking forward to get a game on and try these rules with my friends. I am getting my tine British men these Friday. 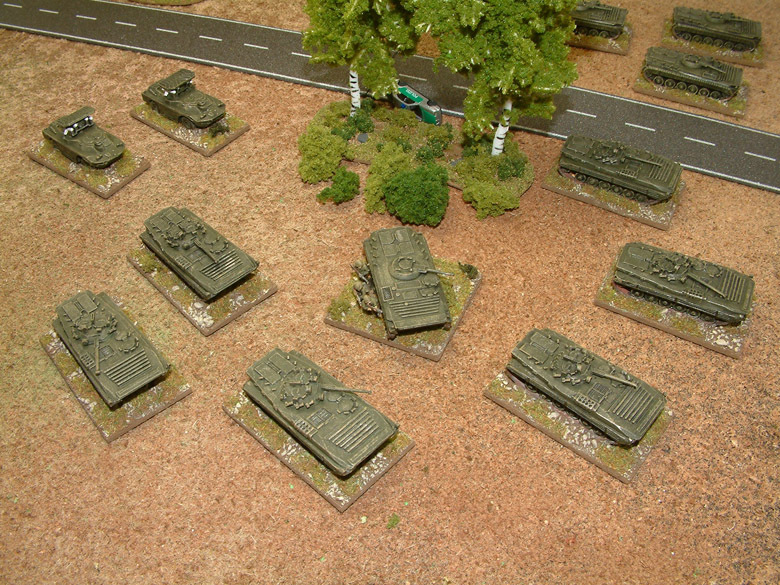 We have opted to use 6mm figures because that is what the rules are built for. And I will build the Brittish BAOR force that will stand ground against the WARPAC. I will keep you informed about my first game and my painting progress of there smal men. I have only painted Epic before in this scale and that was ages ago.